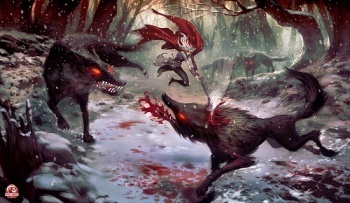 American McGee, best known for his unusual take on children's fairy tales, wants to turn his unique design sensibility to another old-time classic: Little Red Riding Hood. McGee, who made a splash in 2001 with American McGee's Alice and debuted the American McGee's Grimm series in 2008, posted a concept image of the game on Flickr yesterday, painted by two artists at his Shanghai-based game Spicy Horse game studio. A previous image, entitled "Red," went up in February. While he has yet to find a publisher for the game, he plans to pitch it at the Game Developers Conference next week. "If we're lucky an interested publisher will help us move it into production," McGee wrote, noting that if it gets picked up, he'd like to develop it either alongside or right after Alice 2. It doesn't sound like there's a great rush on it, however. "It's an idea that [Spicy Horse art director] Ken Wong and I have been toying with for years," he added. McGee seems to have kind of a thing for putting dark, twisted spins on old children's tales and he previously took a crack at the Red Riding Hood story as part of the Grimm series. And while a stand-alone will certainly be considerably more well-rounded than the Grimm chapter if it finds a publisher, it's a safe bet that it won't be any less weird. American McGee's Alice 2, or whatever it ends up being called, is being developed for the PC, PlayStation 3 and Xbox 360, and expected to come out sometime in 2011.